There are approximately 200–300 species of Iris in a rainbow of colors, yet the quest for newer varieties never ceases. The structure of the flower has a discernible rhythm of three divisions. The three outer sepals which drape downwards are called the “falls.” The three inner lobes or true petals which grow upright, are “standards”, with remarkably distinct characteristics, colors and markings. Then the third feature is the “beard,” a tuft of short vertical extensions growing in the midline, to a broader section or limb with captivating patterns. The dwarf iris is not “bearded” and it springs from bulbs, not rhizomes. illuminations and designers of textiles, tapestries, stationery and interiors. 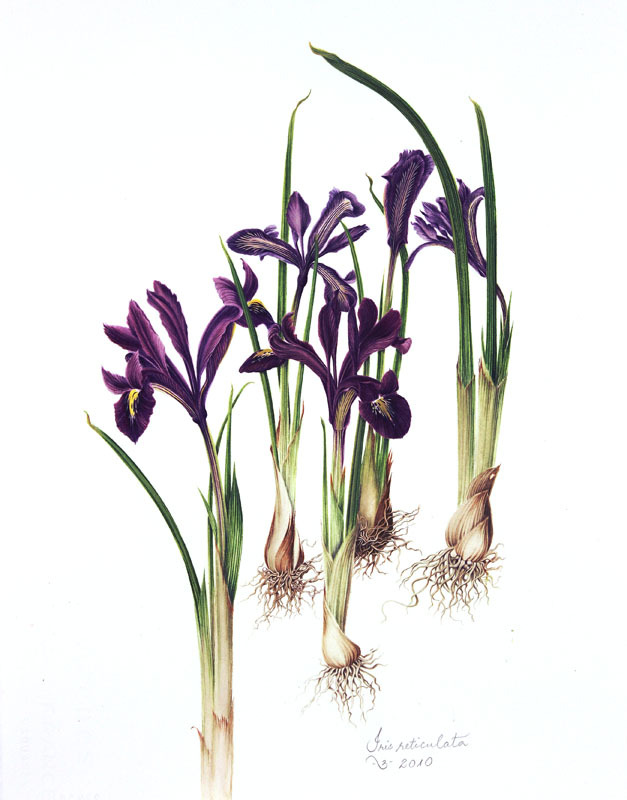 The perfume industry relies on rhizomes (called orris root in the trade) of certain irises, as a base note or fixative while sophisticated brands of gin use the root for the distinctive flavor it imparts. I. reticulata, while native to Russia, the Caucasus and northern Iran, is now widely cultivated in temperate regions. It is a particular favorite in rock gardens notwithstanding its painfully short blooming period. Its leaves, or scapes, unlike the broad fan-shaped foliage of most other iris, are grass-like in appearance. The petite flowers are of an intense purple with the falls displaying a dazzling gold central crest amidst a scatter of tear-shaped white spots. Its arrival in early spring, along with crocuses and snowdrops, is a most welcome sight and a clear message (perhaps from Iris, the Olympian messenger?) that Persephone is on her way with the promise of light and warmth. © 2010 – 2012, milly acharya. All rights reserved.